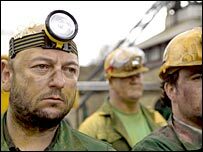 Welsh former miners are going back underground for a new fast food advert. The selected 10 work in the Pot Noodle factory in Crumlin, near Newbridge, and will help advertise a new range of the snack which is said to be healthier. The advert was shot in a disused pit - now supposedly mining noodles - and will have a Welsh-accented tagline "Fuel for Britain, isn't it". Residents of Crumlin have been invited to a screening of the advert before it goes out on network TV. Maker Unilever says fat content has been reduced by 5% and salt levels by 28% across the range, while the vegetable content in some flavours has been raised in the £10m relaunch. A spokeswoman for Unilever said: "It's very tongue-in-cheek but not naughty like some of our previous adverts. "Pot Noodle is repositioning itself in the market and trying to reach new consumers so the advert was designed to give it a broader appeal, not just to giggling student boys." Last year's Pot Noodle ads, featuring the tagline "Have you got the Pot Noodle horn?" racked up 572 complaints but were given the all-clear by advertising watchdog. An earlier campaign had the tagline "The slag of all snacks" banned from all its advertising. The Crumlin factory celebrated its 25th anniversary in 2004 and employs 260 permanent staff and an additional 80 temporary staff when required. The village's coal mine - the Crumlin Navigational Colliery - closed in 1967.